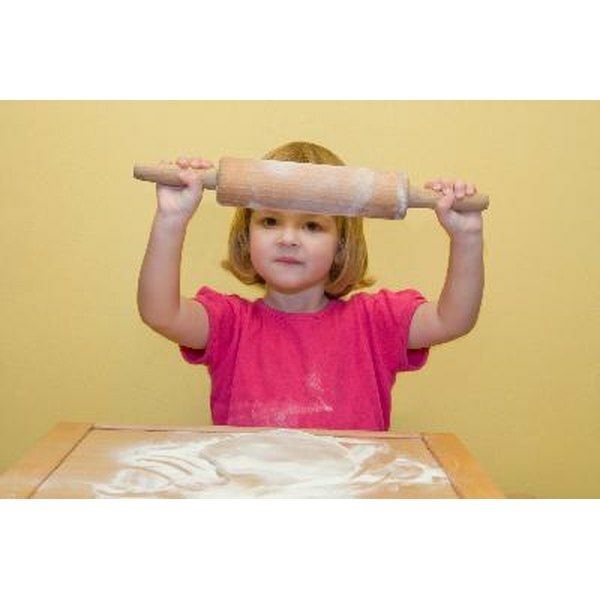 For young kids, cooking can be a lot of fun. For parents, it can be a headache as they worry about all the dangers in the kitchen. However, you both can enjoy cooking, which can also be educational for your tot if you stick to important kitchen safety rules. Even if your child is a toddler, you can bring her into the kitchen and start to instill kitchen and food safety rules that will stick with her as she gets older. Before you let your kids in the kitchen to cook with you, make sure that you set ground rules. They should never touch anything in the kitchen without you giving permission. Make sure your child always washes her hands before and after handling any food, and anytime she sneezes or coughs into her hand. It is also a good idea to use only non-breakable cookware when your kids are in the kitchen with you. If your child is old enough to read, have her read through the entire recipe before starting so she understands the process. You should also emphasize cleaning up as an important part of the cooking process. Clean up as you go to avoid having to do a big cleanup at the end. For a young child, sing a cleanup song to get her into it. She can help you wipe down the counters and put dishes in the drying rack. Emphasize to your toddler that only an adult can operate the oven or stove. For very young toddlers, make designated spot well away from the stove for her to stay in whenever you are opening or closing the oven. Teaching knife safety is also of the utmost importance. Depending on your child, you may want to teach your child how to handle knives safely in the kitchen. Start with butter knives, cutting something soft like bananas. You can find kid-friendly knives at kitchen supply stores that are excellent teaching tools. If you do not think your child is ready to handle any type of knife, make sure she understands they are off limits, as well as other sharp objects such as skewers and toothpicks. Food safety is one of the most important things to teach your child in the kitchen. Show her how to use separate cutting boards for meat, poultry and seafood and the importance of sanitizing the kitchen counter before working with something else. Fresh vegetables and fruits should also be kept far away from any type of raw meat in the kitchen. Do not use any utensils that you used for raw food in food that is cooking or that has already been cooked. Do not let your child lick the bowl that with leftover cookie dough, cake batter or any other tasty goodies that contain raw ingredients. No matter how good it looks, emphasize to your child that she could get very sick if she eats it. Make sure to avoid any choking hazards when your child is ready to eat whatever she has helped prepare. For toddlers and preschoolers, it is essential to cut food into pieces no larger than a 1/2-inch to avoid anything being a potential choking hazard. No matter what age your child is, make sure that she is sitting down to eat and do not allow talking while food is in her mouth. For school-age children, you can also take the opportunity to emphasize good table manners and habits.